This vessel was owned by Federico Fierro as Iberico until bought by Trasatlántica. Propulsion Diesel engine - 8 cyl. 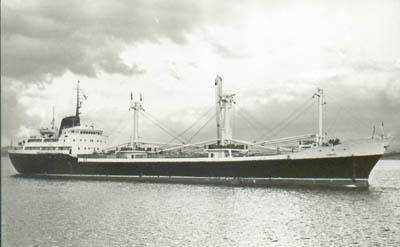 Built in 1958 by the SECN at Sestao for Naviera de Exportación Agrícola, as the Beniel. She was 5,135 DWT; length: 106.89 meters; breadth: 15.83 and depth: 9.4. Her diesel engine of 4,100 HP gave her on sea trials 16.13 knots. Its daily consumption was around 15.5 MT of gasoil, having tank capacity for 662 cubic meters. This photo was shot from the aerial car in Barcelona. The ship was in Vulcano shipyard. Behind her can be seen the Antartico, owned by Marasia. She was bought in 1967 and sold in 1978. Scrapped in 1984. Here is on 1977 at La Guaira roads (Venezuela). 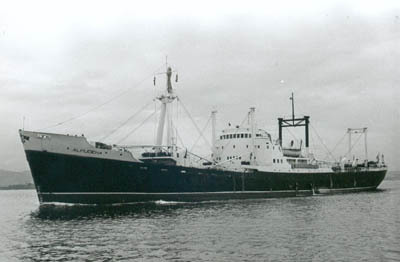 Sister ship of the previous was built a year later by the same shipyard for the same shipping company, as the Benizar. She was also bought in 1967 and sold in 1978. Scrapped in 1984. See in this monograph how she and the general cargo trade were. 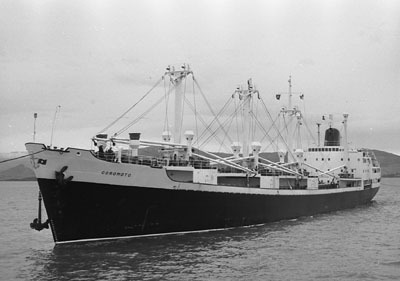 This vessel was ordered by Trasatlántica to Astano at Fene (Ferrol), and delivered in 1969. She was 6,900 DWT; length: 119.85 meters; breadth: 18.0 and depth: 10.55. She was sold in 1981. 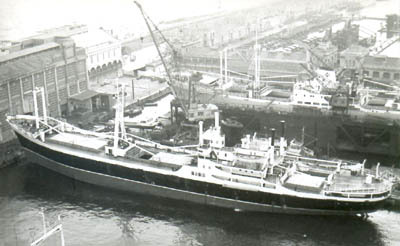 Sister ship of the previous was also built by Astano at Fene (Ferrol), being delivered in 1970. 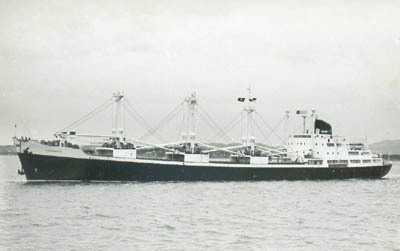 She was sold in 1981 to a Peruvian company and renamed Kipu.